Faux wood shutters and blinds are a great way to decorate any room. 2” blinds, both faux and real wood have been a decorating staple in Fort Myers for over 50 years and the trend does not look to slow. Are all blinds created equal? Absolutely not! The most popular choice is the 2” Faux (pronounced foe, not fox). Also known as the 2” Poli, Imagewood, Everwood, and Forever wood. 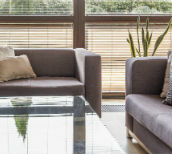 There are many benefits connected to faux wood shutters that allows LIFETIME WARRANTIES against warping, chipping, yellowing and fading. Additionally, faux wood window treatments can be design to replicate certain types of wood, allowing homeowners to customize according to the their living spaces. Faux wood blinds and shutters have become one of the most popular window treatment options over the last few years. Unlike traditional wood blinds, faux wood blinds are more warp-resistant and can sustain UV ratings as high as 500. As a result, this type of blind can endure direct sunlight and heat with no discoloration or damage. Cleaning faux wood shutters is pretty simple, the first step in the cleaning process is to place an old sheet or towels on the floor under the window to catch dust and dirt particles that may fall during the process. Regular dusting is recommended, so that dirt buildup is minimized. To dust, use a dry cloth or a swiffer duster. Avoid using a feather duster, as this will simply cause the dust to fly around and resettle on the blinds, as well as on nearby furnishings. Faux wood shutters and blinds should also be vacuumed regularly. By using the round brush attachment on your vacuum cleaner, cobwebs, bugs, dust and dirt will all be lifted away from both the slats and the cords. Make sure to tilt the slats fully one way and then the other so that both sides of the slats are vacuumed. Since faux wood bshutters and blinds are either 100% plastic or predominantly plastic, they can be washed. A mild nonabrasive soap such as dishwashing liquid mixed with warm (not hot) water can be used along with a well wrung-out cloth. If soap is used, make sure you thoroughly rinse the slats by wiping with a soap free wet cloth that is also well wrung out. If the blinds have been removed from the window for this process, make sure that they are 100% dry (including the cords) before re-hanging. Many owners also finish off their cleaning effort by wiping the slats with a dry fabric softener sheet. This reduces static cling and is quite effective in repelling dust.